Republican candidate for NC governor Pat McCrory said yesterday in Raleigh, while he was filing his papers to run, that he has "disagreed with some of the actions" of his fellow Republicans in the NC General Assembly. McCrory didn't want to get into many specifics about his areas of discord with fellow Republicans, saying there would be time during the campaign. But he said there were several areas. "Several areas." Hmmm. McCrory was perhaps suffering from creeping Rick Perryism in his inability, or unwillingness, to name anything beyond that infamous post-midnight session when the Republicans rammed a shiv into the ribs of the state's teachers. But there you have it, neatly summed up in McCrory's wholly understandable reticence. Why would he want to acknowledge THE issue in the North Carolina elections of 2012 ... the behavior of Jonathan Jordan, Dan Soucek, and their puppet-masters in the NC House and Senate? He would much rather see all of that wreckage go away. The approval ratings of the Republicans in the state legislature are in the toilet for a host of good reasons, including a budget that punished education, the unleashing of polluting corporations from environmental controls, the continuing attempt to mug the voters of this state with unnecessary laws to discourage and even prevent the free exercise of our franchise at the polls, the plan to sell off the state's assets, the clear-cutting of our roadsides by the billboard industry. 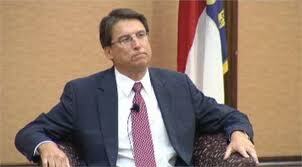 We can't wait for that moment when McCrory gets specific!